i'm trying to make a n64 portable but i need to trim the board and i was wonder if somebody have pictures of how to do it. that depends on how small you are needing to make it, and what revision of board you have. 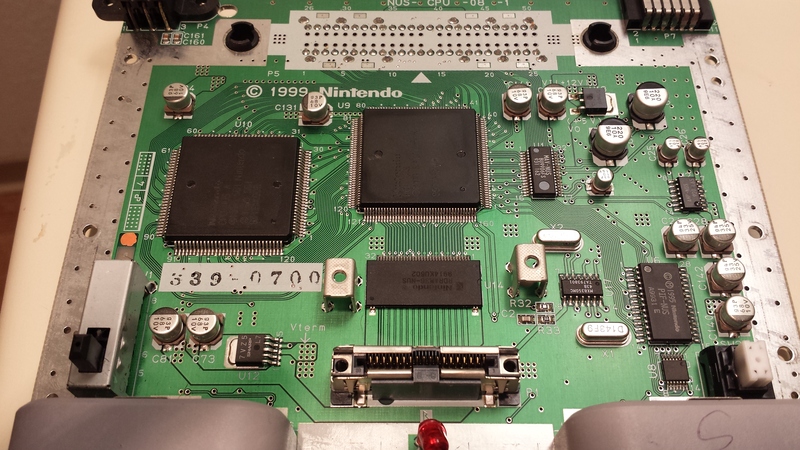 if you could post a picture of your n64 board, front and back, that isn't blurry and we can see it clearly, along with letting us know if it is NTSC or PAL, then we can probably help you. note: none of these pictures are my work. we have yet to create our own n64 guides. this is by far the safest cut you can do. ignore the red line in the bottom left, and instead follow the black line. this cut requires no relocation, per se. 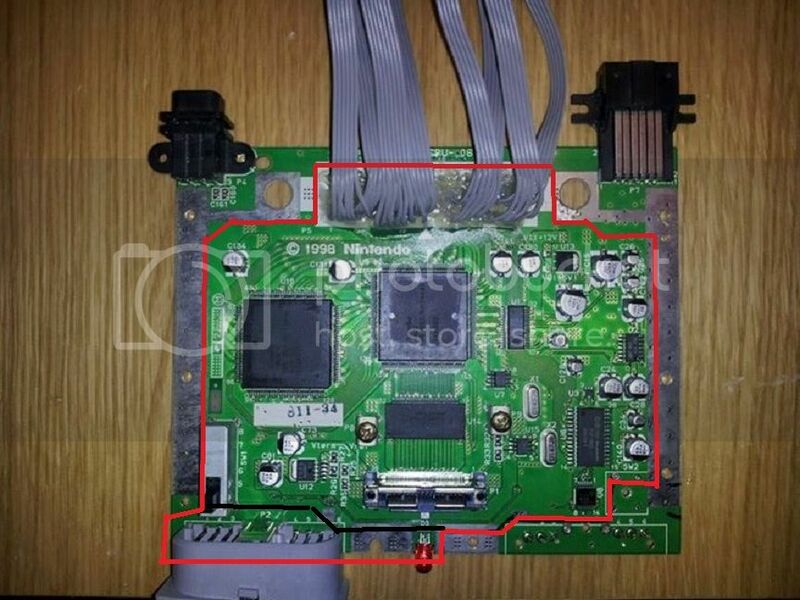 it does not sever any traces, all the ports you chop off are easily wired back on. this is the type of cut that is usually suggested for those new to electronics work. this is one of the "easier" difficult cuts you can do. to quote basement modder: "Red needs no relocating, orange needs 2 traces on the back rewired, and cyan is for RCP wiring." 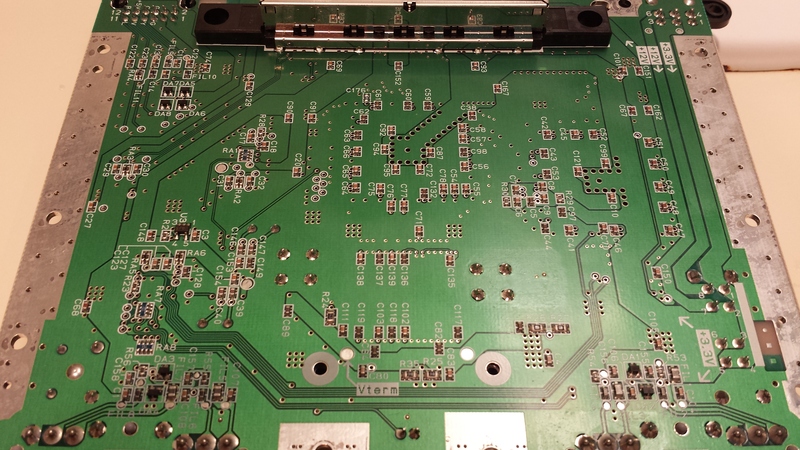 rcp wiring is wiring directly to each chip, not recommended unless you are a pro with tiny soldering and electronics. 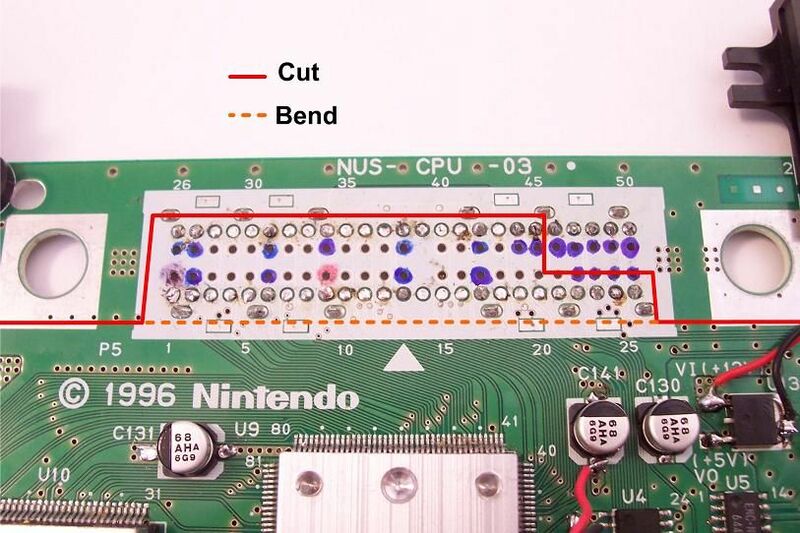 essentially, the board bend, you end up cutting through about 1/2 the thickness of the board from the back side of the n64 board. that side only has 3 or 4 traces that get severed. you then simply bend the cart slot up and over to lay flat. you then wire up the few wires that got severed from the back side, and bam. you have a much smaller board with a cart slot section that is still easy to rewire. 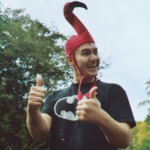 please see this post on modretro for better images of the process. we are still working on getting our n64 guides created and uploaded on here. but we have no issue directing you to where you can get the info. i see that in the second picture by basement_modder i can remove the two capacitor in the left down corner and the u12 too,these have no use anymore? and also i see that it can run on 7.4v but can i still use a 12v battery or it has to be 7.4v? 12V should be fine. It's feeding directly into a voltage regulator which outputs 5V - notice the (+5V) marked on the board right below it. you most likely do still need those caps. basement_modder used a completely stripped board to show easier where you can cut. that board isn't functional that is in the picture as is.